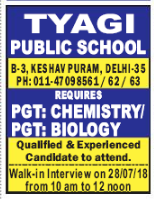 Tyagi Public School, New Delhi has advertised in THE HINDUSTAN TIMES newspaper for recruitment of Teachers PGT jobs vacancies. Interested and eligible job aspirants are requested to walk-in 28th July 2018. Check out further more details below. About School: Tyagi Public School comes under M.S. Education Society (S-16915/1986 DOR 24-07-1986) was established in the year 1988. TPS is a co-educational public school. The school is fully air-conditioned with 100% power back up. Qualified as per CBSE norms. How to Apply: Interested and eligible candidates are requested to attend the Walk-in interview along with CV, originals / copies of certificates, testimonials and recent Passport Size photograph to the walk-in address mentioned below.